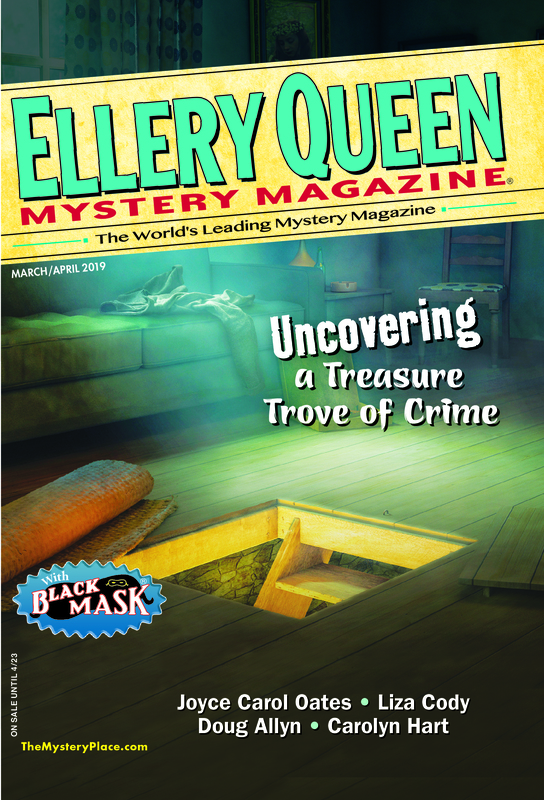 At the 2017 Bouchercon in Toronto, Ellery Queen’s Mystery Magazine was celebrated for its “Distinguished Contribution to the Genre.” Art Taylor interviewed editor Janet Hutchings, and then fifteen special guests each spent a few minutes describing their relationship with the magazine. I was one of the special guests. From the time I accepted the invitation to participate until shortly before the convention, I found myself stumped. My connection to EQMM is tenuous, at best. I co-authored, with Tom Sweeney, a single story published within its pages (“Snowbird,” December 2007). By contrast, the other special guests had been published in the magazine multiple times, and at least one had written for all three of the magazine’s editors. So, when my turn came, I joked about being the group’s redheaded stepchild, invited to represent all the one-hit wonders, the writers who only ever placed a single story (or, in my case, half a story) in the magazine. And I wasn’t joking when I noted that my half-sale to EQMM means so much that I’ve featured it in every author bio ever since. I began writing professionally in the late 1970s and saw my first mystery short story published in a men’s magazine in January 1983. In the early 1980s, three mystery magazines—Alfred Hitchcock’s Mystery Magazine, Ellery Queen’s Mystery Magazine, and Mike Shayne Mystery Magazine—shared space on the magazine racks with a plethora of science fiction and fantasy magazines. Before the end of the decade, two additional magazines joined them—Espionage Magazine and The Saint Magazine—but they, along with Mike Shayne, did not survive into the 1990s. Since then, at least sixty-six mystery periodicals have come and mostly gone. (Sixty-six seems like a great many, but I’m certain I’ve missed several more because I’ve only included in my count the few that have published my stories and the great many who have rejected them.) Though a few of these publications mixed fiction with nonfiction, and a few mixed genres, placing crime fiction alongside horror or science fiction, the majority were home to multiple short mystery stories each issue. Some, such as Mary Higgins Clark Mystery Magazine, were named after famous writers and backed by major publishing companies. Some, such as Argosy, Black Mask, New Black Mask Quarterly, and The Strand, revived magazines of the past. Others were the literary equivalent of Mickey Rooney and Judy Garland movie characters putting on a show in the barn, published by mystery fans and funded with pocket change. Crime and Mystery feature prominently in many of the titles: Crime Factory, Crime Syndicate, Crimestalker Casebook, Crimewave, Detective Mystery Stories, Flash Bang Mysteries, HandHeldCrime, Kracked Mirror Mysteries, Mysterical-E, Mystery, Mystery Forum, Mystery Street, Mystery Time, Mystery Tribune, Mystery Weekly, New Mystery, and Whispering Willow Mysteries. Weapons—Heater, Needle, Plots With Guns, Shotgun Honey, Switchblade—feature in several titles, while color brightens others: Black Cat Mystery Magazine, Blue Murder, Crimson Streets, Malone’s White Fedora, Noirotica, Red Herring Mystery Magazine, and White Knuckles. Then there’s a potpourri of other titles: A Different Beat, Action Magazine, All Due Respect, Betty Fedora, Big Pulp, Down & Out: The Magazine, The Flash Fiction Offensive, Futures, Hardboiled, Hardluck Stories, Judas, M, Mayhem, Mean Streets, Murderous Intent, Murdaland, Naked Kiss, Out of the Gutter, Over My Dead Body!, Pirate Writings, Pulp Adventures, Pulp Magazine, Skullduggery, Sleuthhound, Spiderweb, Story and Grit, The Back Alley, TheCase, Thrilling Detective, Thuglit, Tough, and Without a Clue. The many and varied mystery periodicals that have come and mostly gone were home to the first publications of many of today’s mystery writers—a handful of my earliest stories appeared in Espionage Magazine and Mike Shayne Mystery Magazine—and today’s publications offer similar opportunities to tomorrow’s mystery writers. Though periodicals launched as recently as two decades ago were exclusively print publications, today’s publishers experiment with and attempt to harness new technology. Mystery publications today are presented as websites, as blogs, as PDF files, as emailed newsletters, and as print-on-demand journals, and many utilize a mix of media to reach their audiences. Even stalwart print publications AHMM and EQMM offer electronic editions and connect with fans through their websites, blogs, and social-media accounts. In many ways, new technology has created a renaissance in short mystery fiction. For those of us who love to read (and to write) short mystery fiction, we haven’t seen this much opportunity and variety in quite some time. Though it can be difficult to find the new publications—unlike the days of my youth when a single newsstand carried all of the mystery magazines and the most difficult thing I had to do was push the science fiction magazines out of the way—it is always worth the effort to seek out new publications and new writers. And yet, despite all the opportunities provided by all the publications that have come and mostly gone, those of us who aspire to careers as writers of mystery short stories strive to appear in the pages of Ellery Queen’s Mystery Magazine and its sister publication Alfred Hitchcock’s Mystery Magazine. Ellery Queen’s Mystery Magazine, launched in fall 1941, is the longest-running continuously published mystery magazine, older than most of us who write short mystery fiction. To be a part of the magazine’s history—even as small a part as the one I’ve played—connects us to fans, to fellow writers, and to the genre as a whole in a way that appearing in no other publication does (though appearance in AHMM, the second-longest-running mystery publication, comes close). So, with my half-story in EQMM, I’ve secured my place in mystery history. And if that weren’t enough, I learned after preparing my presentation for Bouchercon 2017, but before leaving home for the convention, that I won’t much longer be the poster child for EQMM’s one-hit (and half-hit!) wonders. I have another story scheduled for publication within the year. This entry was posted in Anthologies, Books, Conventions, Fiction, Genre, Guest, History, Magazine and tagged crime, e-book, journal, lit mag, magazine, magazines, mystery, mystery fiction, newsstand, periodicals, short story. Bookmark the permalink. Congratulations on your first solo EQMM sale, Michael — I can’t wait to read it! Your astounding record of 1200 published stories continues to amaze and inspire me. You have truly out-Hoched Ed Hoch — and that’s one heck of an accomplishment! Michael, congrats on getting another story accepted by EQMM. Competition is murderous as I know from experience. Many of us grew up loving to read mystery fiction and later were inspired to write it as well. Like you, I’ve had many stories published in publications and from publishers that no longer exist. However, as I love writing, I will continue my submissions. Best of luck to both of us. Love this post, Michael–and particularly that image of you pushing the sci-fi magazines out of the way (though bittersweet there, since I wish too that the shelves of every local newsstand had more mystery magazines on them today). And congrats on your upcoming story in EQMM! Enjoyed this, Michael, and congrats on the upcoming EQMM story. I’m looking forward to reading it. Your productivity, by the way, is humbling. As someone who helped kill off some of the pubs mentioned (my stories appeared in the last issues of at least two of them), I too mourn the loss of so many markets. That’s why short story writers value and support EQMM and AHMM. Great article, and congratulations on the new story in EQMM. I managed a small bookstore in the mid-1970s and got to read so many of the fiction magazines of the day.